If the above parameters are met, clients usually go in for re-tubing. Re-tubing is done both at our works & at site also. 3) Tube Sheets are in good condition. Brand: Alfa, GEA (Kelvion), Sondex, IDMC, Tranter etc. 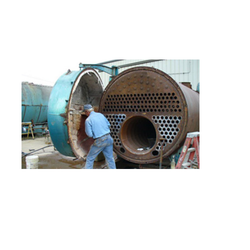 We are actively engaged in manufacturing and supplying superior quality Boiler Retubing. These products are manufactured with great precision using optimum quality material in adherence to international quality standards. Our presented Retubing of Boilers service is widely demanded in medium and large sized industry. We give proper working to all boilers to control the pressure and liquid flow. Moreover, we use extreme durable tubes to repair the boilers in convenient way. We are offering Boiler Retubing Installation Service to our customers by using tube attachment and many other advance methods. Professionals use high quality tubes for the retubing of different sized boilers. Safe from heating and other problems, these used pipes are made of ductile metal. We are providing boiler retubing services where we supply tube profiles including super heater, economizer bank and furnace tubes for boilers of all types. Through this, we tend to serve the client to best of our efforts. This has immensely helped us in helping and very well catering to the various demands of the client. Tube Insertion, Tube Expansion, Tube Trimming of Boilers, Re-tubing of Boilers, Re-tubing of Heat Exchangers, Tube Insertion, Tube Expansion (Flaring), Tube to Tube Sheet Welding, Tube Trimming / Chamfering, Fabrication of Heat Exchangers, Steam & Gas Turbines. Supply of tube profiles including super heater, economizer, bank, furnace tubes for boilers of all make and capacity upto 60 ton/hr.